Saracens extended their lead at the top of the Premiership with victory over London rivals Harlequins in front of 80,000 fans at Wembley Stadium. Chris Ashton scored twice and England lock George Kruis added another as Sarries led 19-9 at half-time, with Ben Botica kicking all of Quins' points. Botica and Owen Farrell each landed a penalty in a try-less second period. Saracens are now four points clear of second-placed Wasps, while Harlequins' play-off hopes are all but over. The Twickenham Stoop outfit are now nine points off fourth-placed Leicester with two matches to play, following Tigers' thrilling victory over Northampton Saints in Saturday's East Midlands derby. Conor O'Shea, who leaves in the summer to become Italy head coach, will now be pinning his hopes of one last piece of silverware with Quins on the European Challenge Cup, with his side set to face Grenoble in the semi-finals next Friday. But Saracens, who play Wasps in the European Champions Cup last four, are still very much fighting on all fronts after a commanding display at Wembley. After Botica had kicked Harlequins into an early lead, two fine Ashton tries and another from Kruis ensured they were always in control against their local rivals. Mark McCall's side need just five points from their remaining two fixtures to be absolutely certain of a home semi-final in the top-flight play-offs. "This game and last weekend's against Northampton are below the standards we'd expect. "We weren't good in some areas and were a bit loose. We made inroads into Quins but then threw the ball away. We weren't patient enough. "Our penalty count was that of a losing team and a third of them came at scrum time, so that is something we'll have to fix for next week. "We scrummed magnificently against Northampton last weekend and we were the opposite of that in this game." "We're disappointed because we set out to win. The penalty count was 18-6 against Saracens, so there's a massive disparity there. "But Saracens are a good side and they're not top of the table for nothing. 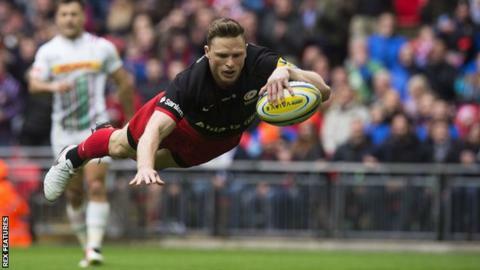 Chris Ashton finished brilliantly. "We know where things have gone awry for us this season, but you couldn't fault the attitude. "We'll wallow because we set our sights high, but we have a Challenge Cup semi-final and once that's over we'll aim for two wins from the two remaining league matches and a trophy."